I have heard that Ramanuja went to Delhi to ask for the idol after it had been plundered. The idol was in a room with other plundered items but when he called out its name the idol came and sat on his lap. He then proceeded to take it back to Melkote. Who was the Delhi Sultan when this happened? Who was the general who plundered the idol? Is this account part of the records of the Melkote temple? Narayana appeared in the dream of Yatiraja and said to him, "I am here in the Yadava hill [Melkote] beneath the ground. Install me and take the white mud." 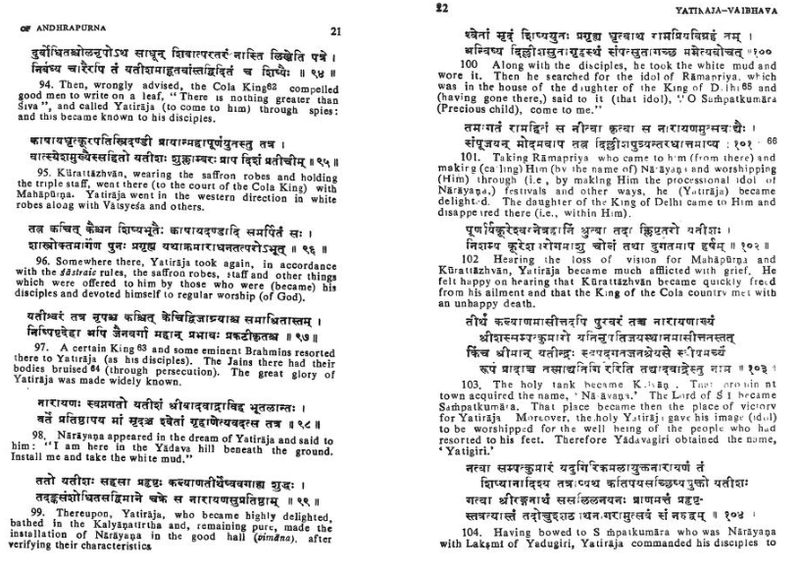 Thereupon Yatiraja, who became highly delighted, bathed in the Kalyanatirtha and, remaining pure, made the installation of Narayana in the good hall, after verifying their characteristics. Along with his disciples, he took the white mud and wore it. Then he searched for the idol of Ramapriya which was in the home of the daughter of the king of Delhi and said to it "O Sanatkumara [precious child], come to me." Taking Ramapriya who came to him [and calling him by the name] Narayana and worshiping through festivals and other ways he became delighted. The daughter of the king of Delhi came to Him and disappeared there [within Him]. Not the answer you're looking for? Browse other questions tagged history temple ramanujacharya idols .